I’m Sherrie and I’m a soupaholic. Yes, it is true. I’m a soupaholic and I just can’t get enough. I love it, any kind, any time. It warms up my soul and makes everything just a-ok. There is absolutely nothing better in the world than snuggling up with a warm bowl of chowder on a chilly wintery day. 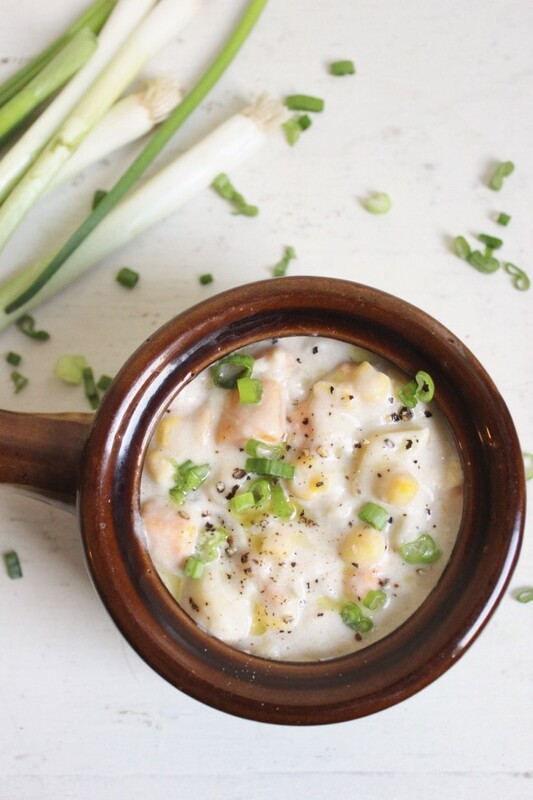 This Creamy Potato Chowder is so hearty; a complete bowl of soul-satisfying goodness. And seriously, I’m just going to say it because I love this soup so much: this might be the best bowl of soup you’ll eat all winter long. Most chowders are full of dairy, leaving your belly feeling pretty heavy. Since I replaced the dairy with cashew cream, this soup is both lighter and naturally vegan. Head over to Potluck to view my complete recipe! This sounds fantastic! Im heading over to check out the recipe now. Yum! this is an AMAZING recipe. I will be using it! I love that – let me know how it turns out! Does this soup freeze? I am cooking for my pregnant sister-in-law and take over loads of whatever I make. Also. Is the wine safe since it is cooked in the soup or should I omit and if so what would I replace it with? The total amount of wine used in the recipe is 1/4 cup, there are up to 8 servings, so that would roughly be about 1/2 tablespoon of wine per serving. That alone, in my opinion, is nothing to be worried about*. AND the likelihood of the alcohol burning off while the soup is cooking is very high; yet another reason not to worry. However the wine is an integral part of the flavor, if you are comfortable using it, I would recommend doing so. *I am not a doctor – please seek the opinion of one if necessary.